Among the thousands he may be a little boy but his pen is mightier than many and it can steal billion hearts or even more than that. Here I am to review an Indian Poet, Student of 7th Grade, the one and only Gaurang Rao and his favorite place is ‘Gaurang’s Poems’. A Student in Grade 7, an Indian who lives in Sharjah (UAE), a mad lover of poems and a mind-blowing blogger, an inspiring poet, a beginner in Tabla – Gaurang Rao is here to share the experiences of his life in his favorite place. “Life is too short and we can’t waste it by worrying”, a quote from the Hindi Movie, ‘Kal Ho Na Ho’, he love this line a lot and that is what he is doing in this world. Gaurang's Poems is his favorite place to share experience of his life as it spreads smiles poetically. With Blogger Picture Template as base, he has designed his blog with a vector image colored blue. This template supports all the features that BLOGGER would support, so it is a wise decision to choose such kind of templates. He has a very good collection of widgets like ‘LABELS’, ‘POPULAR POSTS’, ‘BLOG RATING’, ‘ARCHIVE SECTION’, ‘BLOG STATS’, ‘BLOGOVERSARY’ and a beautiful iPod. Most importantly ‘GOOGLE FRIEND CONNECT’ made following very easy. The archive of his blog says that he pens down from April 2010. The art of genius out at the center, profound words of wisdom and a true master class behind his poems. God must have blessed him with poetry, as the word he pens down is just so beautiful, hats off to the little boy for his wonderful poetry. After mesmerized by his poetry I am happy to review his poetry world. He is a versatile poet, (Sonnet, freestyle and rhymes to name a few) and he has shown excellence in very short period. Aging just 10 months 3 weeks & five days, he has penned 122 poems out of his 127 posts. His poems touch the soul of the readers and wanting them to come back for more. From his recent posts, ‘Why die?’ is my favorite; as he conveyed tears with few lines. Enable Sharing features of Blogger and if you wish, create a FaceBook page for Gaurang’s Poems to reach as many people as possible. The words you pen down are precious, hats off to the little boy for your wonderful poetry. This is Someone is Special, the author of Few Miles, hosting Review Tuesdays along with Vinay (Leo) of I Rhyme Without Reason. 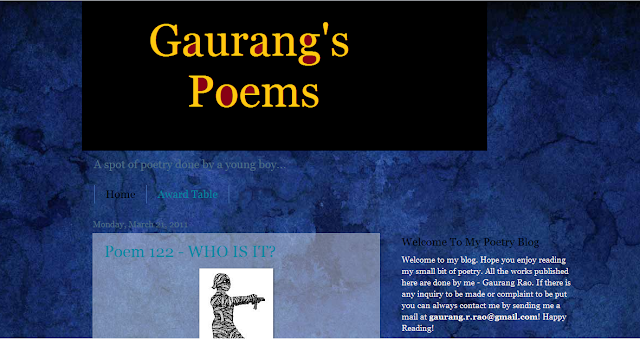 Enjoy the beautiful creations of Gaurang's Poems of Gaurang as I do. Have fun! Jingle Poetry Rocks! SiS, kudos to you for reviewing Gaurang. Such a sweet boy and such lovely work, often about family and teachers. I emailed them about an interview and didn't hear back, so I am absolutely delighted that you did this for the youngest member of our community. Wonderful. And kudos to Gaurang as well. and what else is better than one who starts young- kudos to you gaurang.. I read one of his poems and was amazed, He really is talented. I think Poetry and music are closely linked....I speak from expereience. Have a lovely day and thanks for an interesting post. both of you share something in common, young and talented. I think it's grand that Guarang's poetry is highlighted here. He may be young, but his work shines! Good for this young writer. Beautiful! i feel so happy when JP allows me to comment one after another like it is today. yay!!!! Thank Yo so much Sis. I am really happy to see my blog been reviewed here. It was really a great surprise. Thanks a lot. Admiration, Love, and Wonder come to mind in attempting to describe the poetry of this beautiful soul of such a young man. Had I only found the love in my soul at his tender age, I would not have stirred up so much trouble in my youth. Blessings Gaurang, know you are blessed and loved by so many. Keep up your passionate love for the written word, we NEED you!